The second season of Enterprise continues on the same tone and course as the first, with mostly standalone episodes tackling Starfleet’s first deep space mission. Common to Trek, important social issues are highlighted throughout the season in such episodes as “Stigma” and “Cogenitor.” The Temporal Cold War continues to impact the crew while tensions mount with the intrusive Vulcans as humans continue to establish Earth’s legacy in the galaxy. The season concludes with a devastating attack on Earth, forever changing the series. The Borg, Romulans, and Tholians all make first-series appearances. T’Pol reflects on her ancestor visiting Earth in 1957. Archer and Reed must disable an attached Romulan mine before it destroys the Enterprise. Enterprise encounters a self-sustaining, unmanned repair station. When a deadly virus infects Porthos, Archer spends an interesting night in sickbay. The Enterprise assists a colony fend off bullying Klingon marauders. With Enterprise’s assistance, T’Pol captures a long-hunted Vulcan fugitive. Archer and Reed are captured when retrieving a lost communicator on a primitive planet. The Enterprise crew exhibits unusual behavior as it studies a singularity. A transporter accident leaves everyone to believe that Hoshi’s dead. To protect from a neutronic wavefront, the Enterprise crew seeks shelter inside the nacelle maintenance shaft. Tucker is trapped on a moon with a threatening alien. T'Pol is infected with a stigmatized disease, one only transmitted through contraversial mind melds. 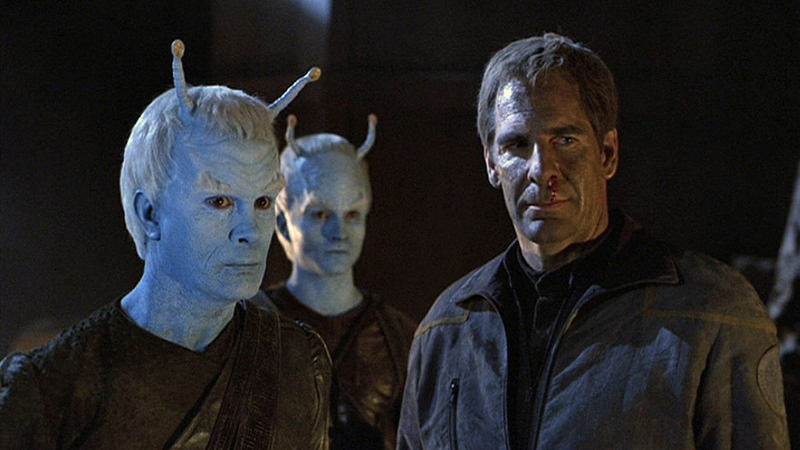 On the request of Shran, Archer mediates a dispute between the Andorians and Vulcans. Enterprise is endangered when it encounters a unique vessel from the future. Archer and Tucker are hostage aboard a hijacked prison transport ship. Non-corporeal beings inhabit various Enterprise crew members. Archer is put on trial for conspiring against the Klingon Empire. Upon news of his father's death, Mayweather visits his family's cargo ship. In the midst of a military coup, Enterprise hurries to rescue a team of Denobulan scientists before they're captured. Tucker jeopardizes a flourishing collaboration when faced with an ethical dilemma. Remnants from a destroyed Borg sphere are discovered on Earth… centuries before Starfleet’s first encounter. With the death of a close colleague, Archer reminisces about their efforts to break the warp 2 barrier. Archer is captured by a bounty hunter intent on delivering him to the Klingons. Meanwhile, T'Pol experiences the symptoms of pon farr. Enterprise is recalled after a major attack on Earth.